Taka-Seigi is shihan Legare's "Budo Name", a name given by soke Hatsumi to honor his warrior spirit and professional dedication. The name translates as "Hawk of Justice" . What makes Taka-Seigi distinct from other Bujinkan dojos? While the nine schools on which it is based are hundreds of years old, the Bujinkan itself is a relatively young and rapidly growing martial arts organization. The unfortunate result of this has been that initially there were a lot of people with insufficient skill and knowledge passing themselves off as qualified instructors. This was particularly bad during the 80's "Ninja Craze" and was a large part of the reason that the grandmaster chose to direct his attention to the broader concept of budo and distance himself from the ninja nutcakes that were causing problems. That has now begun to change and there are many very good teachers to be found within the Bujinkan organization. Good teachers should at minimum have a membership with the Bujinkan Shidoshi-kai licensing organization and have an ongoing relationship with the grandmaster via frequent visits to, or regular training with senior instructors who frequently visit Japan. Shihan Legare's story can be read on his own website. 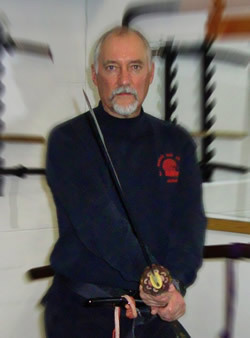 His Taka-Seigi dojo embodies all that goes on in a traditional Bujinkan dojo, and then often looks at the question of "How does this relate to the modern concept of combat?". He refers to this idea as shinken gata, the real fight. Some might suggest that this is an excuse for "sloppy technique", but the truth is the REAL fight IS messy and brutal, fraught with danger, pain and massive amounts of adrenaline. The answer will vary with the person you ask and the stage of their own training. Keep in mind, the reasons you start training are very often quite different from the reasons you keep training. Many people initially come to the martial arts because they are seeking self-defense training - otherwise they might as well play soccer, right? They want self-defense skills because they have a fear of vulnerability on some level. The training allows them to face that fear, remove it, and gain confidence. Strangely, being confident does not necessarily require one to be competent leading to the lore of the blackbelt who gets beaten up in a bar fight... The next stage for the martial artist is where they loose their confidence by discovering their areas of incompetence. They must decide whether it is their chosen style, their instructor, or simply their own training that is at fault. They must then make a change, or give up on martial arts as a whole. Along the way, people often find that certain aspects of training start to appeal to them as much as, or more than, the pursuit of self defense. They may find joy in competition, or learning to co-operate with others, increased ability to concentrate, camaraderie, physical fitness, or just personal development. This may seem like a paradox, to become a better person by learning physical skills that deal with how to hurt other people, but strangely enough it is exactly what happens to dedicated "martial artists". We try to cover a lot of ground in the Bujinkan, trying to avoid as many of the "traps" of traditional martial arts training as we can. Thus we train outdoors and in various conditions and on various surfaces. We deal with multiple opponents, poor visibility, ambush attacks and legal ramifications of self defense. And perhaps most importantly, we talk about developing awareness - your best bet to navigate potential violence safely. There are many reasons to train in martial arts, some of them even valid ;) Spend some time with yourself to determine what it is you are looking for in the martial arts. Then go spend some e-time with Marc MacYoung so that you can avoid getting fast-talked by a slippery budo salesman. With that knowledge, I hope you will come back here and think, "You know this Bujinkan stuff makes sense and appeals to me."